Panthertown – Here, Panthertown Creek and Greenland Creek merge to begin the East Fork of the Tuckasegee. Panthertown is a protected natural area purchased from Duke Power by the Nature Conservancy in 1989 and is now a part of the Nantahala National Forest. The valley is flanked by granite domes and features 11 different natural commmunities, including the rare southern Appalachian bog and forest swamp-bog communities. It’s a great place to hike, and the beginning of the Tuckasegee is easy to find. Wolf Creek –Wolf Creek reservoir is upstream from the confluence. Bonas Defeat—Rock cliff in the Tuckasegee Gorge, an area marked by water-formed potholes in the boulders, named after a deer-chasing dog who died in an attempt to run a large stag over the cliff. Lake Glenville – Built in 1940-41 to provide power to ALCOA for the production of aluminum. Previously known as Thorpe Lake in memory of a former president of Nantahala Power and Light (owned then by ALCOA), it was renamed Lake Glenville in 2002. Flume and Power Plant – The water pipe can be seen along N.C. 107. It carries water from Glenville dam through the mountain to the Thorpe power plant at the bottom of the grade. 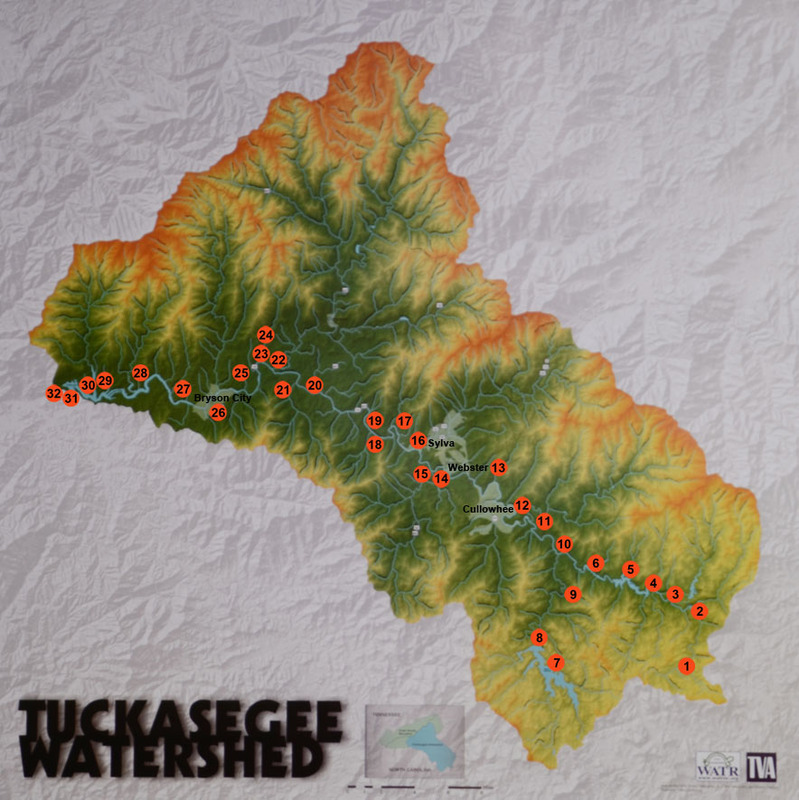 Tuckaseigee – Where the West and East forks meet. A Cherokee village was located here. An archeological study of the site was made into a book, Cherokee Archaeology, by Bennie Keel. Caney Fork – Up this creek is the famed Judacullah Rock, on which are carved ancient petroglyphs. Webster/Trout fishing – Popular trout fishing area downriver toward Dillsboro. Ancient fishing weir – This distinct V-shaped weir can best be seen from South River road. The point of the V is downstream from its mouth. Here, Native Americans would stretch out across the river and move downstream, beating the water and forcing the fish into the point of the V, where a basket was placed to catch the fish. Savannah Creek – After a heavy rain, it is easy to see where Savannah Creek enters the river because of the mud washing down from banks upstream. The old ford, where travelers between Dillsboro and Franklin crossed the river before a bridge was built, was near here. Dillsboro/ Dam controversy/Scott’s Creek/Fugitive Train Wreck/Drowning of tunnel workers – Site of Dillsboro dam and power plant that were demolished in 2010. Scott’s Creek, which flows from Balsam through Sylva, enters here. Downriver a ways, the train wreck in the movie “The Fugitive” was staged. Farther downriver, a number of inmate laborers were drowned when the raft carrying them to work on the tunnel for the Murphy Branch of the WNC Railroad capsized. Dicks Creek – It is said that Horace Kephart camped near the confluence here after arriving in Dillsboro by train in 1904. Whittier – The river here marks the boundary between Jackson and Swain counties. Conley Creek – WATR livestaking project took place along this creek in 2009. Oconaluftee River – The largest waterway entering the Tuckasegee. It drains a good portion of the southeastern quadrant of the Smokies and flows through Cherokee. Kituah – Regarded as the “Mother Town” of the Cherokees. Here the tribal eternal fire burned. Representatives from Cherokee towns would come here to get fire and carry it home. There is a low mound here, where the Council House is said to have stood. It is a nice place to visit – to walk around and stand by the river whose waters served the town in many ways. Deep Creek – Popular camping, hiking and tubing area just before the creek leaves the Great Smoky Mountains National Park. Bryson City – Seat of Swain County, formed in 1871. It was first known as Charleston. Proctor – Home of the Ritter Lumber Co., which began logging and saw mill operations in 1910. Now covered by Fontana Lake. Noland Creek – A lumbering town was established here in the 1880s, also covered by Fontana Lake. Forney Creek – Here, in the town of Forney, the Norwood Lumber Co. began operations in 1910, also covered by Fontana Lake. Bushnell — Town established near the confluence just after the arrival of the WNC Railroad in 1879 also covered by the lake. Named after the Bushnell family of Ohio, who started lumbering operations in the area. Confluence with Little Tennessee – Here, under the waters of Lake Fontana, the Tuckasegee flows into the Little Tennessee, then to the Tennessee, then to the Ohio, then to the Mississippi, and to the Gulf of Mexico. Fontana Lake, formed by dam completed in 1944 to provide power for the World War II effort.